This is a pretty impressive facility with 60 bays split on upper and lower levels looking out onto a collection of target greens. Balls provided are reasonable quality low compression types returned through slopes and automatic water channels. As driving ranges in Surrey go, we think this is the best. Now at World of Golf - Protracer! Viewers of SkySports golf on television will be familiar with the amazing shot tracking technology which shows the path of the golf ball as it's hit until it lands. Now you can use a similar system on the range at World of Golf using your own smartphone or tablet. Several bays have the technology enabled and calibrated for both range balls or normal golf balls. So if you want to find out lots more information about the shots you hit, you will find this extremely useful. And there's no extra cost! Click here for a demonstration of Protracer at World of Golf, New Malden. 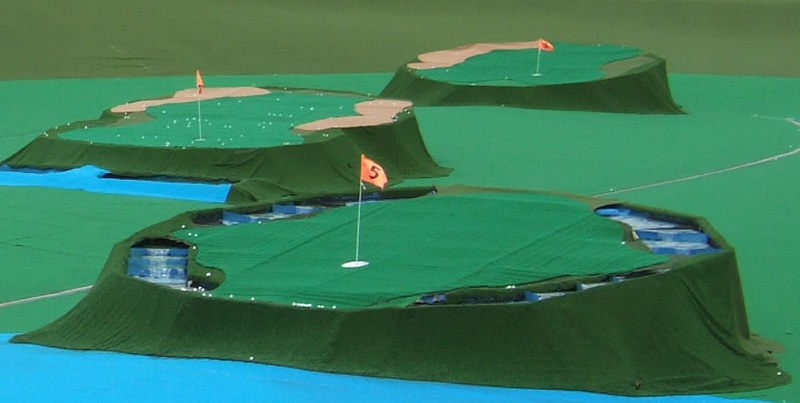 There is a huge range of golf tuition and lessons available at World of Golf. These start from completely free lessons for beginners, and group roll up classes for seniors and ladies at just £5.00 a time (pay for range balls only). A wide range of one-to-one lessons is also available to suit all levels. Personally, we were impressed with lessons from Jon Woodroffe and the team. To see latest details and to book online, click here. World of Golf's in-house American Golf store has one of the biggest selections of golf clubs, equipment and clothing in Surrey. The Jurassic Encounter Adventure Golf is a fun crazy golf course complete, naturally, with large noisy dinosaurs.